Home » Extraterrestrials » Alien archaeology on Mars? Mars has long been a source of fascination for those who seek life off the Earth. Early astronomers noted seasonal changes: the normally red surface of the planet could be seen to develop darker, greenish patches during the Martian ‘summer’, as the polar ice caps melt. They darken annually (in Martian terms) and always in the same patterns; in some years, they are more intense than others. This suggested the existence of plant growth to many astronomers before satellite exploration would suggest otherwise. The twenty-two close-up photographs sent back by Mariner 4 in July 1965 showed a cratered surface with a thin atmosphere (largely composed of carbon dioxide at a pressure of 5 to 10 mbar). Later missions (especially Mariner 9 in 1971, Vikings 1 and 2 in 1976, Mars Global Surveyor since 1997 and Mars Pathfinder in 1997) have shown a dead planet without liquid water, suffering freezing temperatures and swept by violent winds. Nevertheless, they have also shown that conditions were once very different, with evidence for plate tectonics (no longer functioning), river channels, ocean shorelines and an atmosphere formerly richer in oxygen. This has led some researchers to suggest that not only life, but also an advanced civilisation may once have existed on Mars. The part of Mars that has attracted most attention since satellite exploration of the planet began is the Cydonia Mensae region, located in the planet’s northern hemisphere. The region bears traces of former shorelines – it is now accepted by most astronomers that Mars was once home to large bodies of water – and of eroded hills and mountains, corresponding to terrestrial buttes and mesas. A number of features were seen on Viking Orbiter photographs from the mid 1970s that led some researchers to suggest that they were artificial in origin. One of the most impressive parts of this claim was the concentration of anomalies in a single area; these anomalies included what was claimed to be an enormous carved face, three- and five-sided pyramids showing bilateral symmetry and walled compounds. Moreover, some of these features appeared to be in alignment with each other. The so-called ‘Face’ has attracted most attention. The ‘Face’ has been known as that since NASA engineers dubbed it such as a convenient shorthand. Located at about 40.9° N 9.45° W, it was photographed by the Viking Orbiter 1 on 25 July 1976 whilst obtaining images of a site suitable for Viking Lander 2. Eighteen images of the region were taken, but of these, eleven have resolutions worse than 550 m per pixel (in other words, no feature less than 550 m across can be seen on these images). Only two of them (frames 070A13, taken on 24 August 1976, and 035A72, taken on 20 July 1976) have resolutions of better than 50 m per pixel. They show a subrectangular elevated feature that displays roughly bilateral symmetry similar to a human face. The length is estimated as 2 km, the width as 1.5 km and the height as about 400 m. The long axis of the face is aligned at a bearing of approximately 329° to the Martian North Pole. In Frame 070A13, the sun is 28° above the horizon, while in 035A72, it is 11°; these differences in angle reveal slightly different details in the ‘Face’. The ‘Face’ lies close to the boundary between an area of flat-topped mesas and conical hills to its south-west, and a much flatter region in which it lies. Claims have been made for the presence of a former shoreline close to the ‘Face’, which may be important in considering its likely origin. Erosion is generally cited as the main factor in the creation of the landforms in this region, but a variety of claims were made during the 1980s and 90s that this was not sufficient to explain a number of features of the ‘Face’. The original view of astronomers was that the northern past of Mars had originally been covered with a sediment that subsequently eroded, perhaps as a result of wind action. As evidence for the former presence of surface water on the planet has increased, so it has begun to seem more likely that the erosion in this region may have been exacerbated by former seas. The initial announcement of the discovery of this feature dismissed it as being “formed by shadows giving the illusion of eyes, nose and mouth”. The public took little notice of it until DiPietro and Molenaar published an analysis of the formation in 1982, in which they concluded that it was artificial. Since then, a number of popular writers have taken up the theme, most notably Richard Hoagland and Graham Hancock. The widespread availability of computers for processing digital images from the mid-1980s onwards led to a great deal of amateur work on the Viking Orbiter photographs. Different techniques for enhancing the photographs have been used, including techniques that attempt to deduce three-dimensional shape from shadows, the interpolation of pixels and so on. These techniques were all used to make the ‘Face’ appear more detailed and more humanoid than on the original satellite images. The ‘Face’ has become an iconic image, familiar to millions; its ghost-like features stare blankly from the covers of numerous books and videos. Demands for photographs of higher quality than those of 1976 – with their resolutions of no better than 43 m per pixel – grew during the 1990s, especially when NASA announced the forthcoming launch of Mars Observer on 22 September 1992. Equipped with a camera that could achieve a best resolution of up to 1.4 m per pixel, the probe was lost on 21 August 1993, three days before entering Martian orbit. Predictably, the loss of the spacecraft prompted suggestions of conspiracy. They can be discounted on the grounds of cost alone: had NASA wished to reassure the public that it was interested in finding out more about the face whilst being determined to prove it natural, it could have found a less expensive way of doing it than sabotaging a mission designed to obtain better photographs. Indeed, the less expensive means is what the conspiracy theorists suggested about the results of the next probe, the Mars Global Surveyor: they declared the first photograph of the ‘Face’ obtained by the Mars Orbital Camera (Frame SPO-1-220/03) on 5 April 1998 to be fake. The original release of the photograph in an unenhanced form ought to have reassured the public that NASA was being as fair as possible. This prompted yet more claims of unfair play when Malin Space Systems (which had designed the camera) released an enhanced version on the following day, removing the more egregious sampling errors from the raw data. The enhanced version shows none of the signs of artificiality alleged for the 1970s images, despite the claims of its supporters. 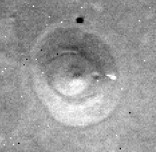 The 1998 image, unlike the Viking Orbiter images, is an oblique, with all the distortion that entails. Even so, the ‘Face’ appears as a highly eroded ridge, with a steep perimeter. A second photograph from the Mars Orbital Camera, taken on 3 June 2000 and released on 31 January 2001, shows only a small part of the ‘Face’, but it confirms the 1998 photograph in every respect. This one, by contrast, is a near-vertical image. Supporters of artificiality have subsequently focused on the bilateral symmetry of the object, with its central ridge (the nose) and the apparent valley below the nose (the mouth); there is, however, no sign of a depression to the north-west of the south-western end of the ridge that would provide the missing ‘left eye’, nor does the ridge appear to be central to the mesa, confirming the lack of symmetry on the unprocessed version of Viking Orbiter image 070A13. To explain the lack of resemblance to the original view of the ‘Face’ as a highly structured and artificial carving, they now have to accept either that it has suffered a great deal of erosion from its pristine form or that NASA has tampered with the photograph taken by the Mars Orbital Camera, as it was the identification of the pristine form that led to the claims for artificiality being made in the first place. The ‘Face’ therefore emerges as an optical illusion (exactly as its discoverers in 1976 had claimed), known technically as pareidolia. This is the phenomenon that allows believers to see an image of Mother Theresa in a cinnamon bun or the Arabic name of Allah in a sliced aubergine. The basis of the illusion is the human brain’s tendency to make understandable and detailed patterns from vague stimuli; the same ability allows us to recognise melodies from short or distorted fragments and to see numbers in patterns of dots used for tests of colour blindness. Faces are one of the first patterns the infant human learns to recognise, so it is unsurprising that a face-like mesa on Mars should be ‘read’; by so many as an actual representation of a human (or closely humanoid) face. Close to the ‘Face’, DiPietro and Molenaar noticed a number of angular peaks. Some of these appeared to be geometrically regular and they dubbed them ‘pyramids’. One in particular, to the south-west, appeared to possess impressive geometric characteristics. It can be seen on image 035A72, to the right of the ‘Face’ and a better view of it was obtained from image 070A13. From the shadow, it can be calculated that the peak stands some 500 m above the surrounding plain. Richard Hoagland dubbed it the D&M Pyramid, in honour of DiPietro and Molenaar, and the name has stuck. The better photograph reveals it to be roughly pentagonal with apparent bilateral symmetry. The supposed main axis points towards the ‘Face’; the south-west angle points towards the ‘city’ and the north-west angle towards a circular feature referred to as the ‘tholus’, named after its resemblance to the Tholos tombs of the Aegean Early Bronze Age. A variety of mathematical relationships have been claimed for the angles and the ratios between them, involving the square roots of two and thee and the relationship e/π. These relationships are impressive, but they depend on an assumption that one face of the ‘pyramid’ has been damaged at some stage and that its shadowed face is as apparently smooth as the undamaged faces. When viewed on a pixel-by-pixel basis, the ‘straight’ edges can be seen to diverge from their supposed lines by up to two pixels (which, at the resolution of this photograph, is equivalent to 86 m). Moreover, the sides that ought to be of identical length for the ratios to be correct are not. The south-western base measures 21.6 pixels (calculated as the hypotenuse of a triangle whose two other sides are 12 and 18 pixels on the image), which calculates to be approximately 930 m; the north-western is 23.7 (i.e. √(112 + 212)) pixels or 1020 m. This is a difference of almost 10%. Similarly, the northern and southern faces, which ought to be identical are 27.2 (√(82 + 262)) and 30.8 (√(72 + 302)) pixels respectively (or 1170 m and 1325 m), a difference of more than 13%. The calculations performed by Erol Torun are based on Mark Carlotto’s enhancement of the image, which interpolates data between pixels; the figures calculated here are based on the original data, lengths of side being calculated by applying Pythagoras’s Theorem to a direct count of pixels on Viking Orbiter frame 070A13. The margin of error in each calculated length is not greater than one pixel, so even allowing for this (and therefore accommodating Carlotto’s enhancements), we cannot state that any two sides are of equal length. The data, poor as they are, will simply not support the assertion. On this basis, we can discount the geometric evidence supporting the contention that the ‘D&M Pyramid’ is an artificial construction. 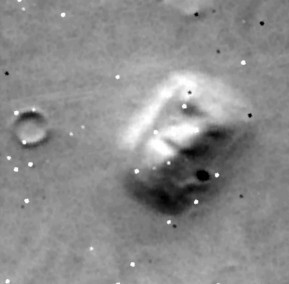 Moreover, the same Mars Orbital Camera frame that rephotographed the ‘Face’ in 1998 also clipped the north-western corner of the ‘D&M Pyramid’. This confirms the analysis of the Viking Orbiter frames, that there is no convincing evidence for artificiality whatsoever in the feature, even though only a small part of it is covered by the image. The sides are not smooth in any sense, the base does not consist of straight lines, nor is there a sharp angle at the corner or between ‘faces’, at least on this part of the supposed monument. In archaeological terms, the case can be considered closed. To the north of the ‘Face’ lies an area dubbed ‘the city’ because of its supposed concentration of monuments. These principally consist of further ‘pyramids’, generally with three or five faces and therefore quite unlike any human pyramids in Egypt or Mesoamerica. The same general problems that attend the ‘D&M Pyramid’ apply here. The supposed regularity of these structures vanishes once a careful count is made of pixel numbers on the raw images and allowance is made for the margin of error in pixel size (which is 47 m on this photograph, 035A72). Moreover, the Mars Orbital Camera reveals a mountain very similar to the ‘D&M Pyramid’. At the extreme north-western end of the monuments is the so-called ‘fort’, which, in DiPietro and Molenaar’s enhancements, gains a row of cellular structures along its eastern edge. 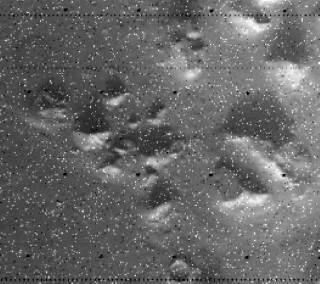 They are too small to be visible on the original Viking Orbiter photograph, which means that no amount of enhancement can bring them out: they can only be artefacts of the enhancement process. 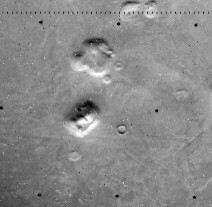 The Mars Orbital Camera rephotographed the ‘fort’ on three separate occasions, with it each time appearing as a low hill with erosion features that include apparently recent landslips. Claims for artificiality have been made for several other sites on Mars, mostly in the Cydonia Mensae region. The ‘tholus’ has already been mentioned, but there is little about its appearance to suggest an artificial origin. 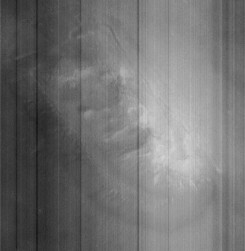 Whereas the 1976 Viking Orbiter photographs give it a smooth and near-circular appearance, the Mars Orbital Camera photograph frame m03/00766, taken on 4 July 1999 with a resolution of 3.11 m per pixel, makes it clear that the feature is entirely natural. There appear to be perhaps three relict shorelines around the feature that suggest it was once an island in the shallow ocean thought to have existed in this area in the remote past. There are also supposed to be further faces, an ‘Inca city’, runways and other features that cannot be explained in terms of geology. Again, many of these turn out to be based on enhancements of the Viking Orbiter images that cannot bear the weight of interpretation placed on them. Claims of this nature are not being made for the Mars Orbital Camera images, except for a few much smaller features that nevertheless also appear to be of geological origin. 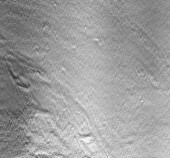 Much of the debate revolves around those features picked out from the Viking Orbiter photographs as being anomalous. 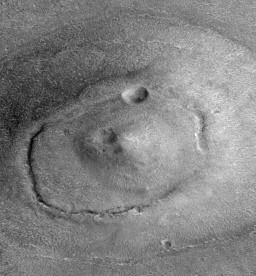 There are at least two other claimed faces, in addition to the crater formation dubbed the ‘smiley face’ by NASA engineers keen to show that the original ‘Face’ was nothing more than an optical illusion. Neither of the two supposedly artificial faces is of a size comparable with the Cydonia Mensae formation, nor is either of them more than vaguely similar to a human face. Both are at very poor resolutions and both resemble pareidolic images of the face of Jesus seen in foliage. Similarly, there have been claims for images of dolphins. There is no need to examine these claims here, as most investigators outside the fringe have chosen to ignore them, and the claims rarely surface in the fringe literature (other than on websites whose content is often very bizarre). 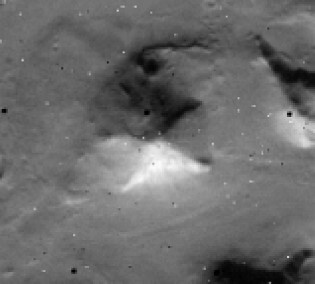 Claims have also been made for the existence of pyramids in Elysium Regio, but they suffer from exactly the same problems as the pyramids of Cydonia Mensae: poor resolution on the Viking Orbiter images and Mars Orbital Camera images that does not support the artificiality hypothesis. 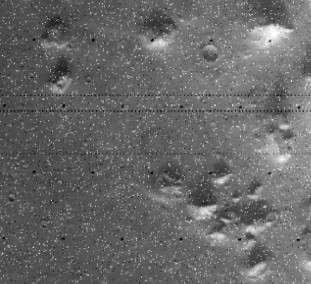 On the other hand, the Mars Orbital Camera is revealing all manner of curious and unexpected formations. The discovery of such features as mottled surfaces apparently deriving from the partial erosion of light sand dunes exposing darker bedrock and so-called ‘glass tubes’ that seem to be volcanic in origin is important in adding significantly to our understanding of geomorphological (areomorphological?) processes on the planet. The Mars Sojourner roving vehicle also showed much the same sort of surface as the Viking landers had more than twenty years previously, but in greater detail and with the advantage of multiple perspectives. What is significant about recent photographs from the planet is the lack of visible artificial monuments, especially claimed new ‘sites’. 25 Responses to Alien archaeology on Mars? This is just bad science. You’ve made significant leaps in your arguments, and you write with a propagandistic tone, using “so-called” and “supposed” repeatedly in contexts that are, quite frankly, not relevant to the debate. let me put it to you this way. you stake your entire claim on the relatively small variances in the “supposed” geometry and symmetry demonstrated by Hoagland et al. However, if you bisect your face with a mirror you will find you don’t look like yourself on either side. Therefore, you are a trick of light and shadow over a natural erosional formation. If you really think that Hoagland has any credibility in examining evidence of artificiality from satellite imagery, then you are sorely mistaken. I use “so-called” and “supposed” repeatedly to show that I’m dealing with unproven claims. Keith, interesting site. Difficult to take seriously though, when every reply, not to mention every article is written with a very condescending quality…even resorting to name calling I see. Unfortunately, this is not the work or etiquette of serious scientists that I had hoped it would be. Good luck with your continuing studies. Thanks for your response. I try hard with my writing not to be condescending in the articles. The effect I’m aiming for is something approaching a dispassionate, analytical approach. At times it is difficult, especially when the ideas being propounded are so patently ridiculous, not to resort to mockery. Yes, I have been goaded from time to time in name calling, but only when that’s what the person to whom I am responding has done. It’s wrong of me, I know. I may edit those responses to remove what was written in the heat of the moment. What you don’t see are posts that I do not approve, which sometimes contain extremely abusive material about me. I’ve had one in which the author (whose identity I suspect but cannot prove) has done a fair bit of research about me so that he can insult me, my employer, my past employers, my family, my personal life and so on. That begins to wear one down. I get angry (which is what the author intends!) and post in haste. I wish I could go to Mars! As a child growing up in the 60s, I wanted to bean astronaut as well as an archaeologist. One of the most important moments of my life was to be got out of bed in the early hours of 20 July 1969 to watch the landing of Apollo 11 live on television. Thanks for this website. When the Face on Mars came out I was naturally excited to learn more, and in my gut I felt that Hoagland and D&M were perhaps going too far. However, as I followed the investigation during the following decades I was really convinced that something possibly artificial was there. But after recent photographic evidence has been made available, I realized that it was, indeed the result of low res photography and pixelization. What we are seeing perfectly natural land forms on an alien planet that underwent an unusual geological history. There are still many mysteries on Mars and other worlds we’ve photographed and I’m open to idea that there might have been intelligences that once occupied these planets (including our moon) but until solid evidence is released – it’s merely a possibility without any real evidence. Anyway, I’m glad to see some dispassionate and objective reviews of these anomalies. I agree with Blah Blah’s comments. I did project management for a engineering and manufacturing companies which supplied NASA with custom built switching systems. These are used for communications, telemetry, laboratory test systems, wind tunnel testing, shuttle pad systems, etc… for over 20 years at Kennedy Space Center, Goddard, Wallops Island, Langley and many others. I found it amazing anything ever got into space at all. After reviewing several of this site’s webpages, the constant condescending comments about most everything are everywhere. All scientific progress starts somewhere as a basic idea or theory. Astronomers and other disciplines such as space and astrophysics, are perhaps the most visible science professions with the least accountability. Physics isn’t really any better, when a man confined to a wheelchair is almost worshiped like a God. For years he said time travel was impossible, then later admitted it was and took credit for it. Same for teleporting, too. Most real advances in any science originate from often unpaid, amateur scientists. Amateur inventors and researchers often think outside the box, and are not grant driven or funding driven as all academia is today. This is just how research is and has been for at least a century. NASA has been caught lying about many things, including the “red sky” of Mars. In my 2005 book “What NASA Isn’t Telling About Mars” I have entire chapter devoted to this. I proved beyond doubt NASA did color shifting toward red. I used their NASA color reference charts which are mounted on Viking Lander and rovers like Spirit, Opportunity that proved NASA was red-shifting images. When the camera took color images of these charts, blue was was made purple and the white stripes on the Viking Lander’s flag were PINK. When I color-corrected these images to MATCH the color reference charts, the sky became blue and the surface looks tan like the Arizona desert. NASA and other agencies “think” no one is ready for the truth, which is yet another lie. TedT’s vitriol against scientists led me to suspect that his wild imaginings were rejected by people who knew more about the subject than he did. Thus his sensitivity to “condescending” attitude. Indeed, just a minute or two of Googling TedT’s book name leads to a morass of conspiracy crankery. Did TedT really just call the author condescending AND make a derogatory comment about a man in a wheelchair in the same comment? Excited for your book, guy. i am clear now that,the pyramids was built by egyptians with the help of an aliens..because none of us dono how could be the earth and its shape.but we had built many kind of pyramids. actually it is the shape we have not found at alllll…. but mayan’s pyramid are built by the human and you can see a many difference between the both..
People are allowed to change their minds. Science does that. People also lie. Scientists are also people. I wouldn’t be slandering people based on disability status if I were you. There could be scientists on this forum with neurological diseases who look up to Hawking because he is a survivor who has inspired a popular interest in the sciences, no matter the quality of his work (and some of that quality is fracking awesome, actually). Now, if colour shifting occurred in Mars images, it might be for more reasons other than attempting to fabricate the appearance of Mars. Although, fabricating that is possible, too. An example could be the technology used to take the photographs. You ought to know better than I do that imaging can be of non visible light spectrum and in doing so can show features that are distorted or blocked by something else. MRIs do this, X rays and such. Mars surface may well be blocked by some of the coverage that creates those violent winds and the sattelites are supposed to be in synchronous orbit, not under the atmospheric layers. So those images won’t show in the original colour as we understand it. Just like the images above. Recalculating the waveforms into the visual spectrum is a complex task and errors and debate about method can occur without deliberate attempts at fabricating the evidence. As for NASA accountability, it is not the only group involved in space exploration these days. The cold war is over. It could be more accountable, as could anyone and anything these days. But NASA seems pretty keen on sharing what it learns in almost real time – such as watching Venus transit last year on the internet. So I wouldn’t be too quick to think the worst of them. Get a telescope. Point towards Mars when it’s next visible ( too close to the Sun at the moment) and have a look at the colour for yourself. The better the telescope the more you will see. It is possible to see some features. The pole caps are visible and when planet wide dust storms occur these can be watched as well. A spectroscope can be used to find the composition of the atmosphere. Any one can do this. However you might be disapointed to find that your results are going to match those of all space gencies that have sent probes to Mars. Whilst probes give us more detail, the basic make up of Mars can still be observed from Earth using ever more sophisticated amateur equipment. After all before the space age telescopes, spectroscopes and radar were used to find out about the planets. And they are still used today by both professionals and amateurs. So if you don’t believe Nasa about the conditions on Mars, check for yourself. It might surprise you that is does have a reddish colour by the way or is there a conspiracy amounst all telescope manufacterers and Nasa. It’s pretty obvious all these “artifacts” are optical illusions. The “city” looked like a bunch of rocks to me. The “pyramid” didn’t look perfect. Also,there’s plenty of rocks on Mars. There’s bound to be a few weird looking ones. It covers the second face at Cydonia along with two distinct dolphin-shaped features. I first read about the Mars Face in Analog 1988. I found the pictures interesting but unconvincing without more data. Which we got in 1998. 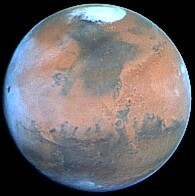 The best argument I could make is: If the Mars Face was real, Nasa would have released/leaked the data ASAP. It would have done wonders for their budget. Man, these pictures are smaller than my eye can see. Are you kidding me? We see a HD images of galaxies million light years away, but never see a HD images of the Moon and Mars anomalies. Do you ever ask yourself WHY? You blindly believe and that’s your biggest mistake! Frankly, looking at Mars rather reminds me of the northern half of Africa on Google Earth, however, in a far more advanced state of aeolian erosion under harsher atmospheric conditions. The predominance of oxides across its surface however, suggests this came from the erosion of huge magmic outflows, the scale of which would suggest some global cataclysmic event prior to this. I would even go so far as to suspect both Phobos and Deimos as having formed from magma subsequently thrown into space by some massive asteroid impact. If this is the case, I doubt that anything artifically made prior to this cataclysm would have survived the tremendous forces. Events of this scale would have changed the face of the planet almost entirely. Conversely, it would have taken a much larger Mars of fluid dynamics under its crust to retain a atmosphere suitable for life in the first place. Either way, these are questions that can only be properly resolved by on-site geophysical studies; although there is geologic evidence enough in the various surface formations to indicate how this planet systematically came to its demise. This may only be a theory as any other, but makes more sense than looking for spurious suggestions of artificial structures to prove what to whom? If alien civilizations exist (I’m neutral towards the exo-planet “another earth” hype in the press), then they had histories. Some may have died out and others gone past the stage of monumental buildings, but alien archeology exists. Whether it exists in the solar system remains to be found. There is a great fringe industry that demands ancient astronauts as the doers of everything our ancestors did, but that’s mishegoss. It also should not present any real evidence from being examined. If Mars was once inhabitable and warm with hydrogen as the greenhouse gas, then for how long? If Venus once had oceans and an earth like surface temperature, then for how long? How long does it take for evolution to bring forth an intelligent species? What if evolution is only partially correct and intelligence is selected for by a strong anthropic universe? I don’t argue this to imply UFO aliens, it’s likely that any intelligence died out both on Mars and on Venus because Mars could not keep it’s atmosphere and Venus experienced a hellish global warming due to the sun’s increasing energy output. It’s not likely that either planet evolved an intelligent species capable of space flight because we don’t see clear remnants of their space program. Either would be interested in earth as the last habitable planet from their perspective. But when we get beyond this solar system, we will either find other star systems barren of advanced life or we will find life to be very common, with cultures at all stages, so exo-archeology will someday become a true science and not part of a conspiracy theory aimed at NASA for allegedly suppressing evidence. There’s indisputable proof that water existed on Mars arguably a million years ago when the climate was much wetter. While you can make a case for cydonia and the other formations, there’s something about the D&M pyramid that doesn’t add up. While Hoagland maybe going way too far in making his claims as there is no certainty or proof without a proper excavation of the site, one has to ask oneself how long archaeology extends? A few ten thousands of years? What if you extended the time frame to over a MILLION years? What would a artificially made structure look like after a million years of wind erosion and precipitation from dust storms etc.. ? There is simply no precedent in Archaeology for that and the reason why is based on the closed-minded assumption that no intelligent life could have possibly existed on Mars. Of course maybe there never was an intelligent civilization but to completely exclude the possibility is like saying the earth was flat. Good analysis but… still, not a single word about the mounds and their intriguing geometrical arrangement. I find this useless. It’s theory after theory. One pictures shows a face, the other doesn’t. Your more likely to say that the second picture doesn’t show it, so it’s no real evidence. Others will say well the first picture shows it so it’s not clear evidence that the second one is telling the truth story. It’s all theory and speculations. And speculating further why Most Probably that’s Not true is just a waste of time. Best way to do a research is to find information, be unbiased and not to take sides (in my opinion). While criticism always takes sides, thus why I find it a waste of time. Knowledge is power, you find more information, get closer to the truth, you build in knowledge. You Build up, and read everything. From fiction to evidence from many credible and not credible sources. Criticism just choses the things that it can easily justify as prove of being Most Probably not true or showing that there’s not enough evidence. Speculations, that often destroy theories and is very biased.